So, where were we? What, mail to answer? Okay, mail to answer. Hey, Kurt, we met at the Portland show and I bought SUPERSTAR and thought it was great. Any more of this coming out? 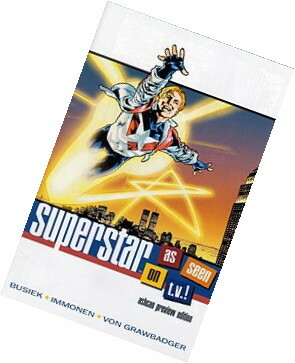 Thanks and I am looking for more of Superstar. Not soon, at least. 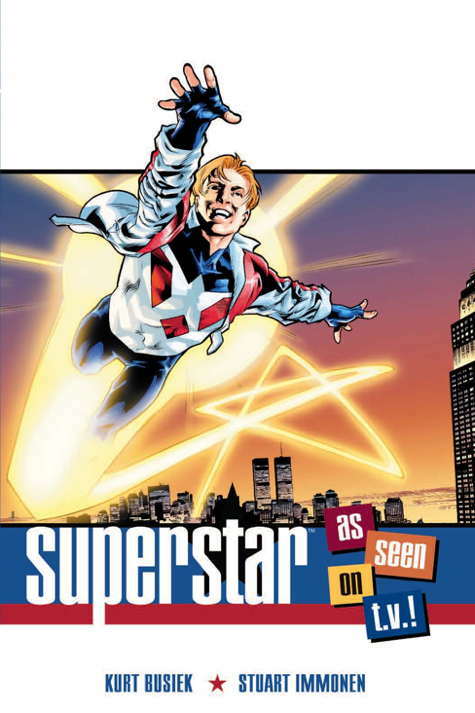 But more Superstar is definitely something I want to get to—if nothing else, I came up with a big sprawling epic story for the character and haven’t been able to tell even that one, much less all the others. So someday, I really want to get to that one, at least. I really hope this isn’t the end of Superstar! What can we do to revive his career? He has so much potential, not only to fight evil, but really change to world for the better by inspiring his fans to volunteerism and activism. Captain Amazing, at one point in the movie, violently rips the Pepsi logo off his costume from among the many others festooning it. Does he wear the pink ribbon of breast cancer, the multi-colored one of autism awareness, the black one in memory of MIAs and POWs? Does he go on talk shows to defend against drinking and driving, teen pregnancy, racism, or illiteracy? If it’s revealed that he can only take the life force of willing givers, that goes a long way to alleviating my former apprehension of his soul vampirism. 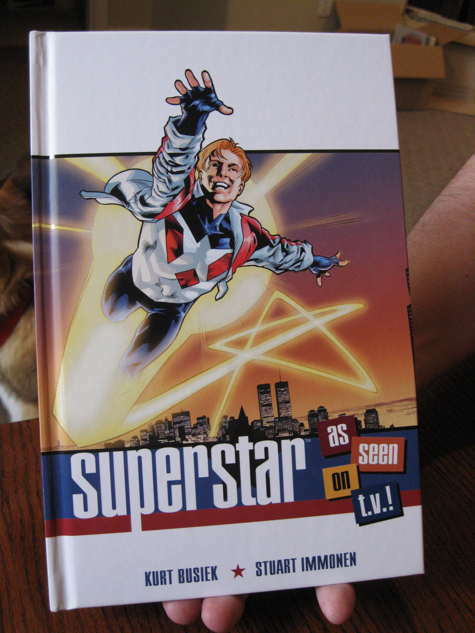 Superstar is the first hero I know of who has the responsibility to use his power to support itself. Remembering that he uses life force, he has to use it in a way that his fans feel is appropriate or he will lose his fans. With great power comes great responsibility and that is no more true for any superhero than it is for Superstar. Yes, Superstar’s energy donors are all volunteers. And Superstar’s not devouring their souls, just absorbing some sort of bio-chemical energy, or something along those lines. It’s science, not spiritualism, and he doesn’t take it by force, like a vampire. But that big epic story I mentioned above? It’s very much about the idea that if he doesn’t do what his supporters feel is appropriate, he loses his support—and thus, his power. What happens when his supporters feel he’s unworthy? Similarly, what happens if he doesn’t want to kowtow to popular prejudices? He’s something of a politician-hero, or needs to be, and that’s very much a two-edged sword. Hey, folks. I’ve been under the weather for much of the last six months, and trying vainly to keep up with deadlines, so there hasn’t been much time/energy left over to blog. But I’ve built up a bunch of e-mails to answer, so let me take advantage of a quiet Sunday afternoon to deal with some of them. Since you ended up revealing that Kang may never become Immortus in AVENGERS FOREVER, do you have any personal theories about the true identity of each character might be? Or Vance Astro being Rama-Tut given both were living in the same time period of 3,000 and both retained docu-chips of the Heroic Age? To be honest, James, I didn’t think there was any mystery as to who Kang really is—even when Stan was floating the idea that Kang and Dr. Doom could be the same person, it didn’t make much sense. Kang, at least as I write him, is just what we saw when his history was first explained: A guy living in a future so well-run that there’s no adventure any more, so he creates a time machine and goes off in search of it, becoming the greatest conqueror the universe has ever known. 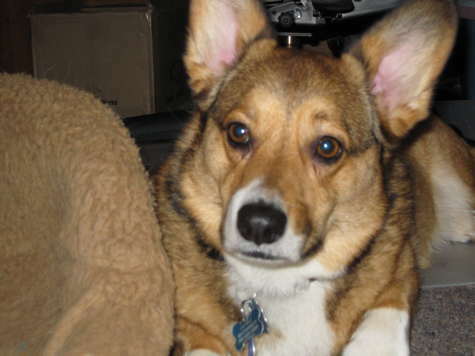 His motivation is dead simple: He was bored, and he wanted a challenge, wanted to forge a grand legend. So he did. That’s all I need to know. I don’t much care who his 20th (or, now, 21st) century forebears are—particularly because over a thousand years, family trees branch out so much that he could be descended from von Doom, Richards, Stark and a dozen other figures. Or none of them. It doesn’t seem to affect, to my mind, who he is or why he does what he does, so I was always more concerned with what he’d do next more than where he came from. 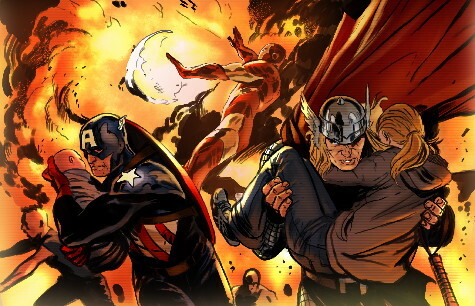 As for what happened in AVENGERS FOREVER, that wasn’t meant as a revelation that there are unknown secrets to Kang’s or Immortus’s origins—merely that Kang, by sheer force of will (and with the ambient aid of the Forever Crystal, no doubt), wrenched himself away from his destiny, forging a new track. Immortus was still Kang, but via a different time-branch than this Kang is now following. They have the same pasts they always did; they just now have divergent futures. 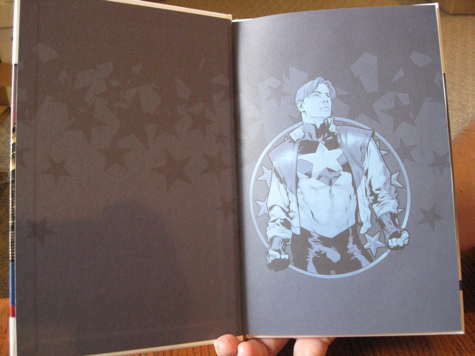 But of course, it’s up to Marvel to say what’s so and what ain’t—this is simply how I viewed it at the time. 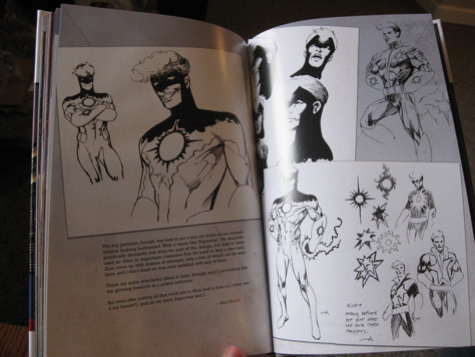 Since you were a friend of McDuffie’s and the Milestone crew, I just wanted to ask, what’s DC going to do with Static? Rozum leaving has added even more problems (also, there’s some good discussions in that thread that apply to why an excellent book like XOMBI failed). I’m not sure Robert L. Washington III is a big enough name to keep the book from sinking. I’m a fan of RLW, but can’t you push for Geoff Johns or Morrison to write it? Maybe you could suggest that to DC? 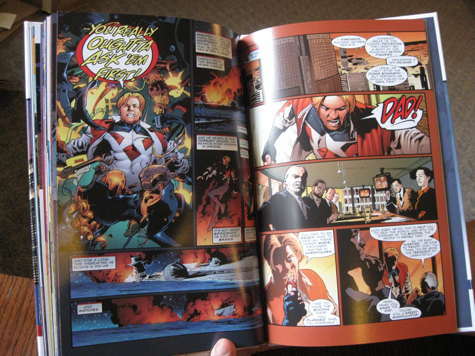 DC usually has a habit of killing characters off (especially in big events) when their solo series crash and burn. And if Static manages to escape that sort of fate, it’s still more than likely the character will never receive another book again if this one tanks this badly. Sorry, Rick, but being a friend of Dwayne’s doesn’t give me any inside information of DC’s plans, or any influence over them. I have no idea what their plans for STATIC are, nor can I push them to put the already-hugely-busy Geoff Johns or Grant Morrison onto the book. If Geoff or Grant wanted to write it and had the time, they’d probably have been writing it right from the start, and if they don’t, me suggesting it isn’t going to make them change their minds or open up their schedule. Were I editing the book, I’d probably have given it to Bob Washington, because he co-created the series and is a good writer with a great sensibility for that sort of story. But I’m not, and that doesn’t mean that whoever they tapped to replace John—Marc Bernardin, I believe—won’t do a good job. And Scott McDaniel’s a terrific artist who brings a ton of energy to whatever he does. I worked with him on TRINITY and loved it. So at this point, I’d just see what comes. 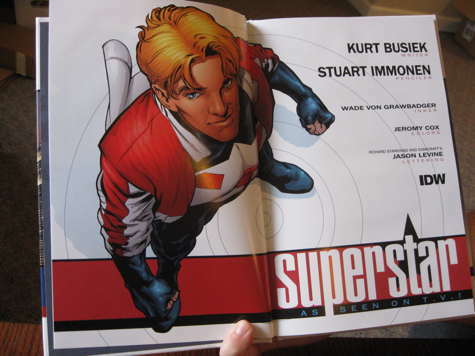 Kurt, I’m desperate for some good news about the return of ASTRO CITY. I keep checking your site periodically (no pun intended), but of course you haven’t posted there since April. I know you got caught in the demise of Wildstorm, and then probably further delayed because of all the attention focused on the big relaunch this month–but please tell me that DC isn’t stupid enough to let it languish indefinitely! Am also wondering about that “American Gothic” kind of book you announced…any plans for that to see the light of day, or is it a dead letter now? No, ASTRO CITY’s not going to languish indefinitely, and yes, Brent and I have been plugging away at it, piling up pages to make sure we can have the book run monthly when it does come back. And yes AMERICAN GOTHIC (now called THE WITCHLANDS) is still in the works. It’s just all taken a lot longer than we originally expected. 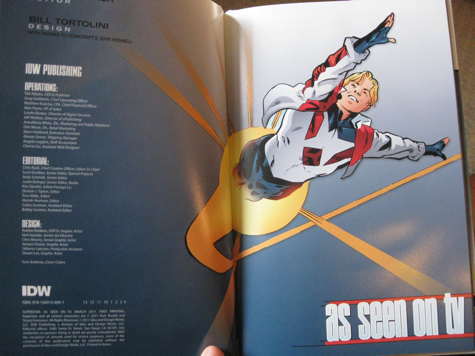 Part of it was the demise of Wildstorm and the reorganization and relaunch of DC, yes, but part of it happened even earlier, during the business reorganization that happened when Paul Levitz left the company and DC went for a long stretch without a publisher. 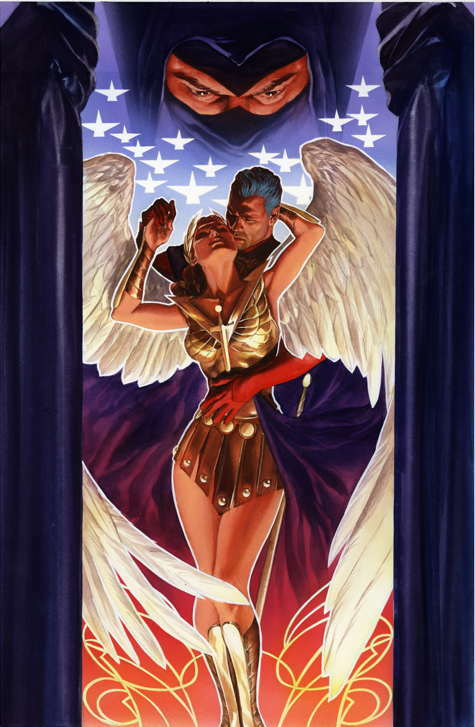 During that time, we made big plans to relaunch ASTRO CITY as a monthly and to launch AMERICAN GOTHIC alongside it, so I’d have two monthly books standing side-by-side at Wildstorm, and that’d be the core of my writing career for the foreseeable future. But the business details of all that took forever to work out, because it was happening while DC was working out bigger and more complex business issues themselves. Just the sort of thing that happens, from time to time. Trouble was, while I was waiting for all this stuff to work out, I still needed to stay busy, so I wound up reviving BATMAN: CREATURE OF THE NIGHT, which had been put on the back burner a few years earlier, and agreeing to do KIRBY: GENESIS with Alex Ross at Dynamite. And once I was committed to those, naturally, the business deals all worked out and presto!, I suddenly had twice as much work as I could comfortably handle. And on top of that, I got sick—a resurgence of the detox-related fatigue problems that stem from my bout with mercury poisoning, and the assorted side effects that come with it. So I spent months trying to meet too many deadlines, and if I was fully healthy, I might have managed it, but since I wasn’t, things just went really slow. And finally, we decided this just wasn’t working, and reorganized things a little. We put THE WITCHLANDS on the back burner for now—it would have been nice to have it debut the same month as ASTRO CITY, but I just can’t feet four sets of deadlines at once, not right now. Used to be I could, but I was younger and healthier, and these are more challenging books. And I’ve got enough done on CREATURE OF THE NIGHT that Jean Paul Leon can keep drawing for a while without me needing to turn in the next script. So right now, I’m working on ASTRO CITY and KIRBY: GENESIS, and that’s going to be my main workload until K:G is finished. Once that’s done, I’ll finish off CREATURE OF THE NIGHT. And once that‘s done, we’ll get THE WITCHLANDS up and rolling again, so I’m only trying to meet two sets of deadlines at any one time. We’re far enough ahead on ASTRO CITY at this point that we should be able to make an announcement in the not-too-distant future about when it’ll be back (but the word “weekly” won’t be in it, I can tell you that! ), and the rest will come along as time and schedules permit. I hope that counts as good news—and I’ll stick in one of Alex’s gorgeous upcoming covers to sweeten the pot! 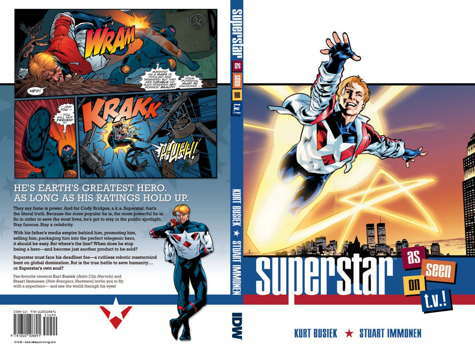 Look for this cover in your local comics store in March, because that’s when IDW’s new Superstar: As Seen on TV hardcover hits the shelves! And as a Special Added Super-Bonus, click here for an 8-page preview! Are we nice to you, or what? All the action, suspense and characterization you expect from Kurt Busiek (Avengers) and Stuart Immonen (Superman) plus, an incisive look at superheroes and celebrity in a world where fame literally is power. Special note to online sites, blogs and what-have-you: If you’d like to showcase any of this art (including the preview) on your site, feel free—Stuart, IDW and I would be glad to have you spread the word!